Zurich, Switzerland, Sept. 17, 2013 - ABB, the leading power and automation technology group, has successfully commissioned the subsea transmission link connecting one of the largest offshore wind farms in Europe to the Belgian grid. The Thornton Bank project, executed for the Belgian company C-Power NV was completed on schedule. The transmission link was constructed as part of an expansion of the Thornton Bank wind farm. In the first phase of its development, six wind turbines with a total capacity of 30 megawatts (MW) were built and temporarily connected to the mainland by ABB. The second and third phases of the project involved adding 48 wind turbines to the wind farm and connecting the complete wind farm, taking its overall capacity to 325 MW. The transformer station platform collecting and transmitting the power to the coast of Belgium is placed 30 kilometers (km) offshore in the North Sea. As part of the turnkey project, ABB was responsible for the system engineering, design, supply and commissioning of the alternating current (AC) subsea cables, the land-based cable systems as well as the offshore substation and platform that houses it. 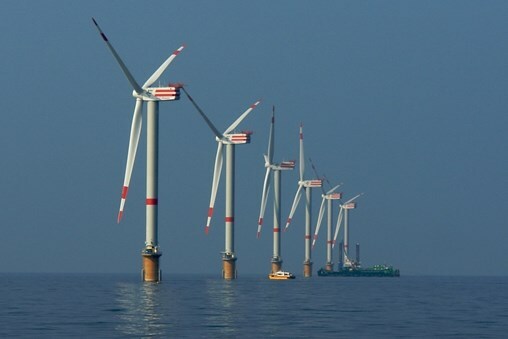 The wind turbines are connected via underwater medium-voltage cables to the offshore transformer station where the voltage is boosted to 150 kilovolts (kV) and connected to the mainland grid. The electricity is then fed into the grid at the Slijkens high-voltage substation located at Bredene, about 3 km inland. The wind farm has a generating capacity of more than 1,000 gigawatt-hours of electricity per year, equivalent to the annual consumption of about 300,000 households in Belgium. It will contribute approximately 7 percent of Belgium's targeted renewable energy commitment by 2020. The Thornton Banks wind farm helps avoid CO2 emissions of approximately 415,000 tons per year compared to a traditional gas-fueled power plant. "Integrating renewable energy sources to the grid is a key focus area as Europe strives to balance the need for electricity with minimizing environmental impact," said Brice Koch, head of ABB's Power Systems division. "The close collaboration with C-Power combined with ABB's technologies, domain competence and experience were key success factors in the smooth execution of this project." ABB provides a wide range of products, integrated solutions and expertise that enable the efficient generation, grid integration, transmission and distribution of onshore and offshore wind power.